1 How do I change my status message? Open the content area. Go to More > My Profile to change your status message. 2 How do I change my cover photo on my profile? Open the content area. From your profile, tap Edit Profile and select the camera icon on the bottom-right corner of your cover photo. You can choose an image from your device album or set it as a default image. 3 I want to remove my game status from my profile. Open the content area. Go to My Profile > Edit Profile or go to More > Edit Profile and tap the Music / Profile Status menu to remove your current game status. 4 What are the photos stacked up on the top-right corner of my cover photo? Open the content area. If you tap the photos, you will be redirected to your Feed page. 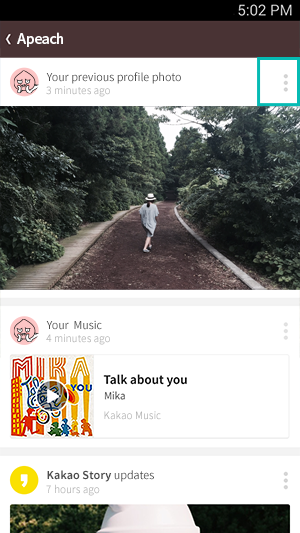 Here, you can see your activity - updates on your profile, and updates on services linked to your Kakao Account. 5 I don’t want to show my profile updates on my Feed. Open the content area. Go to Edit Profile and disable Display Updates on Feed and your future updates will not be shown on your Feed. Please make sure you have updated your KakaoTalk to version 5.4.0. 6 I want to remove updates from my Feed. Open the content area. Tap the three-dotted icon and delete each update. If you want to set it as private, select Only Me and nobody else will be able to see that update. 7 I want to bring back my KakaoStory posts to my profile. Open the content area. 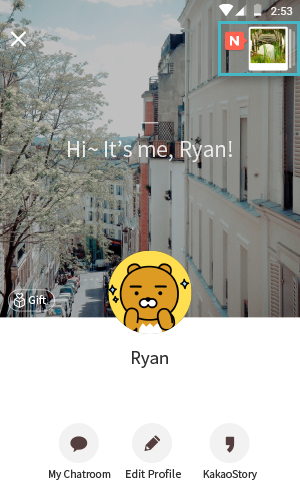 Go to your KakaoStory's Settings and enable Link KakaoTalk Profile before you post a story. Posts you have set Public after you enable the setting will be displayed on your KakaoTalk profile. Please note that you must connect the same Kakao Account to your KakaoTalk and KakaoStory. 8 I linked KakaoStory to my KakaoTalk, but I don't see any of my KakaoStory posts on my Feed. Open the content area. Your past updates will not be automatically posted on your Feed when you link your KakaoStory account to KakaoTalk. Of course, any updates made after linking will be posted on your Feed. 9 I unlinked KakaoStory from KakaoTalk, but my past updates are still shown on my Feed. Open the content area. Your past updates will not be automatically removed when you unlink KakaoStory from KakaoTalk. Of course, any updates made after unlinking will not be posted on your Feed. As for your past updates that are already on your Feed, you need to remove them manually.